WASHINGTON, DC — The U.S. military denies having a “direct relationship” with members of a Kurdish militia under attack from Turkey in Syria’s Afrin region despite acknowledging they have “familial ties” to the very same Kurds who helped the U.S.-led coalition bring the Islamic State (ISIS/ISIL) to its knees in the region. During a House Armed Services Committee hearing on Tuesday, Gen. Joseph Votel, the head of the U.S. Central Command (CENTCOM), acknowledged the American military is facing a “very difficult” situation in predominantly Kurdish Afrin, home to clashes between the Turkish Army and the Kurdish People’s Protection Units (YPG). In January, Turkey began air strikes and ground incursions into the predominantly Kurdish enclave of Afrin, where CENTCOM has no presence or direct relationships in northwest Syria, in an attempt to, according to the Government of Turkey, “remove the terrorist threat from its border.” Though we have no relationship with YPG fighters in Afrin, who previously cooperated with Russia and the regime, these operations directly impact our ability to affect a lasting defeat against ISIS through the [U.S.-allied] SDF [Syrian Democratic Forces]. The YPG is the armed wing of the Democratic Union Party (PYD) that controls parts of northern Syria. Many fighters in the SDF have familial ties to the Kurds in Afrin, and they are now forced to choose between completing operations against ISIS fighters in the MERV [Middle Euphrates River Valley] and assisting their fellow Kurds in northern Syria. Our alliance with Turkey is paramount, and we will continue to assist the Turkish military in countering the PKK [Kurdistan Worker’s Party] and other VEOs [ violent extremist organizations] that threaten their border, but we must continue to urge restraint as their actions have clearly increased risk to our campaign to defeat ISIS. 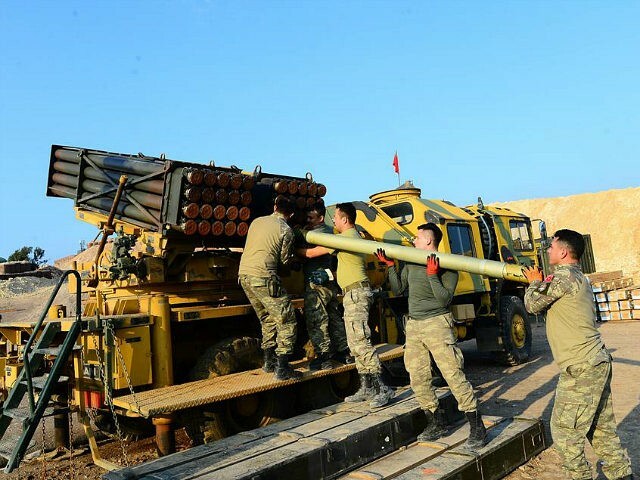 Although NATO member Turkey has long considered the YPG a component of the U.S.-designated terrorist group Kurdistan Workers’ Party (PKK), the American government has continued to provide military support to the Kurdish militiamen in their fight against ISIS. Afrin appears to be the exception. Our partners do not always want us to solve their problems for them. So we enable them to stand on their own. And, while this approach does present its own challenges and can be more time-consuming, it provides local solutions to local problems. This approach is not without risk, as we are seeing unfold in Syria today. But, in general, it is proving very effective. We have achieved incredible success against ISIS in Iraq and Syria. The Iraqi security forces and Syrian Democratic Forces are operating at their most effective levels since Operation Inherent Resolve began. And now, over 98 percent of the territory previously held by ISIS in Iraq and Syria is no longer under their control. The destruction of the ISIS physical caliphate is imminent. Throughout the fight against ISIS, the United States has praised the Kurdish fighters in Syria as vital allies. “Our partners on the ground in Syria have advanced us a long way towards our objectives, and we will stick with them through the completion of this fight,” claimed Votel. Despite the key role that our partners on the ground, the Syrian Democratic Forces and the coalition have played in dealing defeat to ISIS, Russia has placed this progress at risk with their activities, which are not focused on defeating ISIS, but rather on preserving their own influence and … control over the outcome of the situation. Turkey began its air and ground campaign into the Kurdish-held Afrin region on January 20. Kurdish officials have accused Russia of assisting NATO member Turkey. The Turkish military claims it has “neutralized” 2,083 so-called terrorists, including YPG troops since its offensive into Afrin, dubbed Operation Olive Branch, began.